Rear Admiral Louis Malesherbes Goldsborough was born in the city of Washington, February 18, 1805. He early manifested a predilection for the sea. At the breaking out of the war with Great Britain in 1812, being then seven years of age, he waited upon the Honorable Paul Hamilton, Secretary of the Navy, and solicited an appointment as a midshipman. He received this position without the aid or even the knowledge of his father, his warrant bearing date June 18, 1812 – the very day on which war was declared. In great exultation the incipient hero returned home with this unquestionable evidence of his appointment. His father was, however, a man of too nice a sense of honor to allow his son to draw pay while he was yet too young to perform duty. He accordingly waited upon the Secretary, and, while thanking him for the appointment, declined his receiving pay until capable of active service. The boy-sailor wore his uniform and attended school in Washington for several years, finally going to sea in 1817. His first cruise was in the ” Franklin,” a seventy-four, the Flag-Ship of Commodore Stewart, then in command of the Mediterranean squadron. She sailed from Philadelphia October 14,1817 , having on board the Honorable Richard Rush, Minister to England. The services of young Goldsborough as a midshipman were varied, in both character and position. He was promoted to a lieutenancy, January 13, 1825. Obtaining leave of absence, and having an unofficial opportunity of visiting Europe, he made an extensive pedestrian tour in France and Switzerland, spending a fortnight with the Marquis de Lafayette. In 1827 he joined the “North Carolina”, Captain Rodgers, in the Mediterranean. While cruising in the schooner “Porpoise”, in the Grecian Archipelago, he distinguished himself by his dashing and gallant capture of a piratical brig-boarding her, and driving the pirates into their boats, and finally to the shore, keeping up a running fire upon, and producing great slaughter among them. In September, 1840, while in command of the “Enterprise,” he captured at Bahia, Brazil, the pirate “Malik-Adhel”, with a valuable cargo, which he sent into Baltimore. He received his commission as a Commander in the United States Navy, September 8, 1841. He was second in command of the “Ohio,” at the bombardment of Veracruz; commanded a body of the crew of the “Ohio,” detailed for shore service at the taking of Tuspan; and, after the Mexican war, was senior naval member of the joint Commission of Army and Navy officers to explore California and Oregon, and report on various military matters. He was appointed Captain, September 14, 1855. From 1853 to 1857, he was superintendent of the Naval Academy at Annapolis, a position for which his studies and his mathematical ability fitted him in an eminent degree. During his administration many important improvements and changes were made, the general efficiency of the institution was greatly increased, and he received the special commendation of the Secretary of the Navy. After being relieved from this duty he was ordered to form a portion of a board to revise the “Ordnance Manual” for the use of naval officers. In 1858 he was ordered to the command of the frigate Le Congress, forty-four guns, the Flag-Ship of Commodore Sands, on the Brazil station. He returned home in that ship, just after the opening of hostilities in 1861. After being unemployed for a short time, he was, through the influence of Secretary Chase, appointed to the command of the North Atlantic Blockading Squadron, and hoisted his pennant on board the “Minnesotrt” Roanoke Island, the scene of Raleigh’s colonization scheme, was the key to all the rear defenses of Norfolk. In the joint expedition to capture that island, early in 1862, Burnside with 10,000 men were convoyed by a fleet under Flag-officer Goldsborough, and the island was taken by a combined attack, February 8, 1862 . For his services on this occasion he received the thanks of Congress. He dispersed and destroyed the confederate fleet under Commodore Lynch, in the North Carolina waters. During his absence the “Merrimac” made her celebrated raid into Hampton Roads. 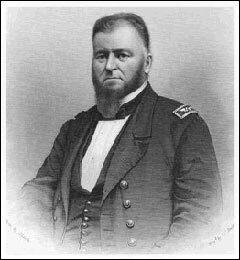 He was appointed Rear-Admiral by act of July 16, 1862 , and soon after was relieved of his command. After the close of the Civil War, Admiral Goldsborough was put in charge of the European squadron. This was a mission of peace, and in his many reunions with brother sailors of other nationalities, he proved as genial a social companion as he had formerly been formidable as an enemy. He ended his active and useful life in the city of Washington, February 20, 1877.